Read the true story of my personal panic attack due to events in front of the Aristide mansion in Tabarre --- On Saturday afternoon 27 Sept 2014, I left Pernier, a village not far from Tabarre Haiti, to run a few errands. My first stop was at Carrefour Clercine to drop somebody off. On my way there, I drove by the gates of former president Aristide's mansion. I saw a police truck with a few police officers across the road, no sign of any problems, I drove by, no problems... So that's what I thought!!! I dropped my friend at Carrefour Clercine, down the road from Aristide's house, and I headed to Delmas, my second stop, with a plan to return to Carrefour Clercine to pick up my friend... Simple right? But I have to return to Carrefour Clercine to pick up my friend... What the ****??? The man replied: "A monchè, pito ou fe moun saa chache yon lot fason pou li abrike li epi rete Delmas tande paske Tabarre sho laa. 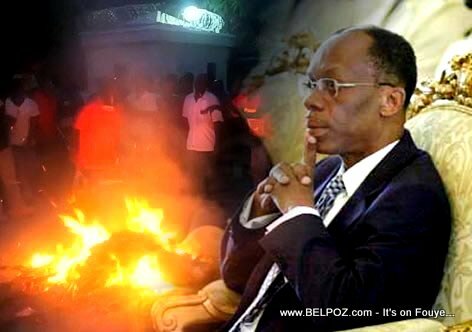 mwen tande Cite Soley ap mobilize pou ale devan lakay Aristide"
I called my friend: "Do you see anything going on at Carrefour Clercine? I heard there are problems over there?" "Nope," She replied, "Nothing except the busy afternoon traffic!" So I left everything else I had to do that evening, and headed to Carrefour Clercine afraid that something terrible is going to happen to me, to my friend, to my car or worse ALL of the above! With so many warnings NOT to go, I went anyway. I had to pickup my friend and take her back home safe. It was such a NO BIG DEAL that I actually wanted to pull over to take some pictures... But my friend said "OH NO... Let's GO! LOL... Let's go home!" There you have it folks... My eyewitness account of what happened Saturday in Tabarre in front of Aristide's mansion... Those who did not see it or live it are out there creating more panic than what happened. Let's not forget, Haitians are great storytellers, we are really good at "METE pase GENYEN"
We Haitians are like Chicken Little, we always think the sky is falling!!! Haitians are like Chicken Little, we always think the sky is falling!!! Oh my goodnes I love this statement. I like your story, its funny. Good story bro! Toujou gen lot rout. Ou te ka pran rout delmas/aeopo pou dessann Kafou Klesinn, gen plizye kote nan zonn anwo yo ou ka gen akse rout delmas. Stay away from Tabarre as much as you can. Beton an ap chofe because yap fe yon jan to keep aristide out of the elections.